My younger son came home for the weekend and asked if we could 'do something' on Saturday. So we decided to go to Castle Douglas, a lovely little market town about 30 miles away. It's one of those places with a lot of independent shops and is the Food Town of Dumfries & Galloway in South West Scotland. As the mission was to 'do something' we decided that, as well as visiting the delis and gift shops, we would go to the Sulwath Brewery and take a tour, great I thought, this can go on my blog. I checked out their website and located the visitor centre which is just off the main street. We arrived at the 'visitor centre' which is really a sort of pub, serving their own beers, quite a nice little pub. We asked about the tours and were told that they only offer tours on Monday and Friday at 1pm unless by prior arrangement. I must have looked pretty disappointed and mentioned that it had not said this on the website and we had come specially to see the Brewery, so they agreed to give us a mini tour for free. It turned out that the man giving us the tour was Jim Henderson who set up the Brewery which is now run by his son, Allen Henderson. He told us all about the malted barley and the hops, how they don't use any artificial ingredients, no caramel, no concentrates (which are used by large brewers) and then took us through to the brewing area. It really is a micro-brewery, it is basically a large brick built shed with the stainless steel tanks for brewing in it. One of the most interesting things was that they do their own bottling, because bottling firms want huge quantities to go through and that is just not going to happen in micro brewing. Because of this, other microbreweries get them to bottle their beers too, and even some larger brewers who are trying out small quantities for export will also use Sulwath to bottle their ales. Originally brewed as a celebration beer to commemorate this one time Buccaneer's 250th birthday anniversary in July 1997. He was born on the neighbouring farm to our original brewery site at Southerness. Such has been the popularity of this brew, that we include this with our mainstream products regularly. John Paul Jones is dark amber in colour, with a perfect nose reminiscent of summer meadows. Pronounced tastes of best "Maris Otter" malt with a hint of Brambling Cross fresh Hereford hops, combine to yield a suggestion of sweetness in the aftertaste, making this an extremely pleasant drink. 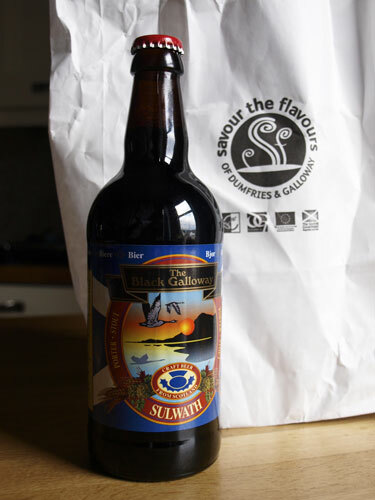 The Black Galloway, seen in the photograph, wasn't on draft yesterday, so a bottle was purchased to try at home, it is a stout or porter. I have to say it was a very interesting visit, I didn't try any beer, not because I don't like it, but because I was driving, but it seemed to go down very well. I would recommend the tour if you are in the area and even just to drop in for a pint or half pint. Everyone is very helpful and friendly and I would like to thank Jim Henderson for giving us him time outside the usual tour schedule. Flavour Fortnight 2011 - just a note to say that Dumfries & Galloway's Flavour Fortnight is from 3rd - 18th September to coincide with Scottish Food & Drink Fortnight. I'm hoping to get to a few events, check out the website and think about visiting this beautiful area of Scotland. THANKS for this GREAT post Janice, I love real ale and am an avid supporter of small micro breweries, and this was so interesting. LOVED the photos and I am now on my way over to the website. I've seen a lot of info advertising for the Flavour Fortnight. It sounds really good but sadly too far for me to visit. Hope to see the results of your trip on your blog over the next few weeks!